Russell’s Circumplex of affect. 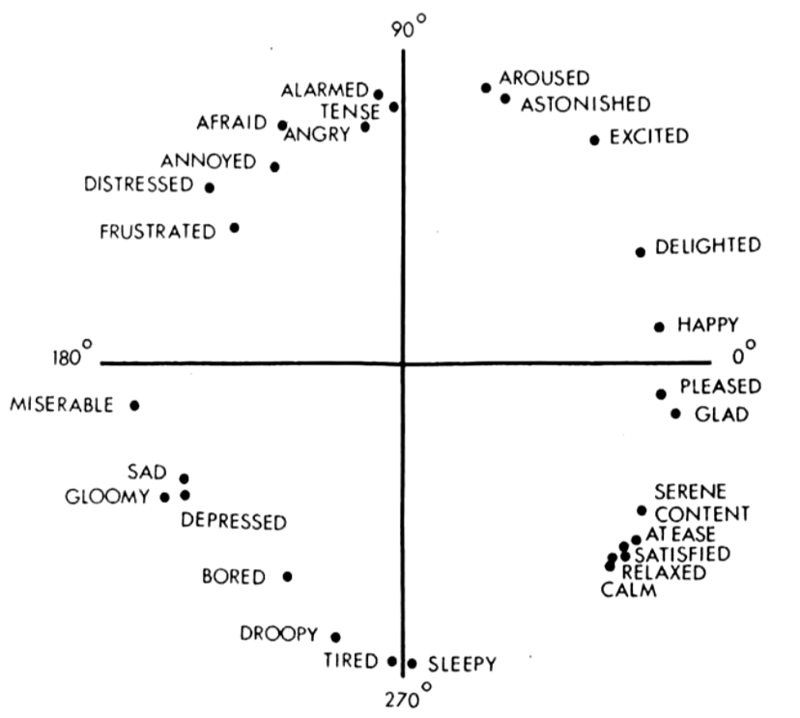 Sentiment (negative to positive) is on the X axis and intensity (low to high) is on the Y axis. Is the one whoz GOing to Light Up your Day!!!!!!!!!!!! We use a set of Facebook posts from the amazing MyPersonality dataset consisting of 115,312 users with their reported age, gender and Big 5 personality (self-assessed). We automatically score all their posts for sentiment and intensity. Each user is then assigned the average score of its messages for both aspects. Both sentiment and intensity are correlated in the same direction for all user attributes because both annotations are highly correlated as well (.526 Pearson correlation between user scores). This means positive sentiment messages are higher in intensity, while negative sentiment messages are usually low intensity. This is likely caused by the annotators not being fully able to distinguish the two dimensions. The largest correlations are between females and both affect and intensity. The average female affect and intensity scores are 5.24 and 3.24 while the average males scores are 5.09 and 2.96, significantly lower in both cases. This adds to a long standing debate over whether females are higher in expression of emotions. Both dimensions are correlated positively with age, but to a lower extent. Researchers previously found that positive emotions increase with age, while negative emotions decrease. [caption id="attachment_323" align="alignnone" width="799"] Sentiment and intensity Pearson correlations with user attributes such as gender (point biserial correlation with females), age and personality. Conscientiousness, extroversion and agreeableness are all positively correlated with sentiment and intensity (more positive and intense messages), while people who are more neurotic and have high openness to experience post more negative and less intense messages. Psychologists describe the presence of positive affect as a distinctive trait of extraverts (e.g. higher frequency of positive affect, activity). On the other hand, neuroticism is associated with the presence of negative affect. If you are interested in reading more about sentiment analysis, I recommend reading this review paper. 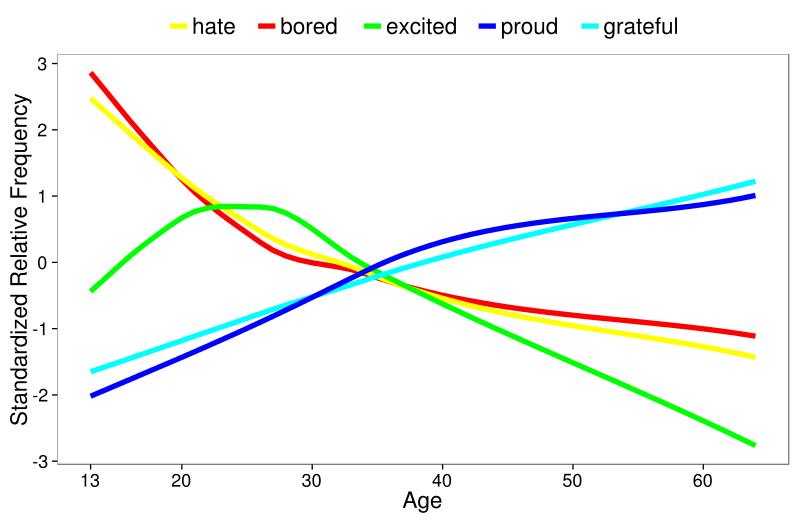 Sentiment and intensity Pearson correlations with user attributes such as gender (point biserial correlation with females), age and personality.